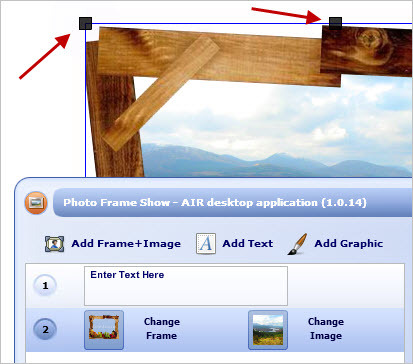 Each individual object (frame+image, text or graphic) belongs to a separate layer. In the Layers list you can control each layer's content or change the each layer's order. The application's working space is called "Canvas" and you can set it to be transparent or to have a solid color. You can also change the Canvas size and orientation for better screen resolution results. 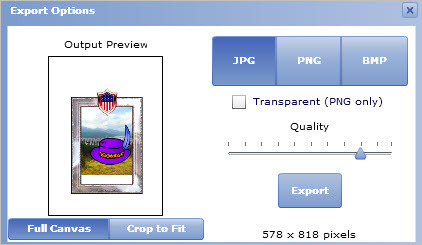 After a photo is framed you can export the composition as a flat image, saved in JPG/BMP/PNG format. This is also needed if you plan tp send your work via e-mail so this image will work as an attachment. When a Layer is selected you can change its appearance with the edit controls (at the right of the application's window). Such editing can also be applied in all layers (treated as one). There are controls available for Move, Scale and Rotate and when you click in any of them, the modification applied occurs gradually.The use of the contols is good when you require the modification to be pixel-perfect. Alternatively, you can directly click on a layer and when the layer's control nodes are displayed, you can use them to change the layer's appearance with your mouse. If the "Rotation Snap" is enabled, your selected layer will be automatically set in one of the major axis angles (horizontal - vertical - diagonal) when your current rotation reaches their predefined values. For example, when your current rotation is close to 88 degrees, this option will force the layer to lock in at 90 degrees. 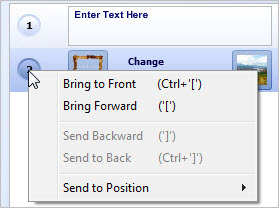 At the top-right side of the application window, the Compact Mode button reduces the window size to the absolute minimum where only the modification controls are available. 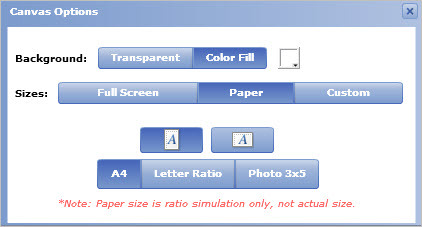 This is useful when working in a screen whose resolution leaves less amount of free space. At any time you can click the button again to restore the original window size. All frames you do not own a license for, will have a watermark. In order to use watermark-free frames you will have to login to a Pro account and use your credits (or purchase if necessary) to license the frames of your choice. How do I change my frame or the image inside it? 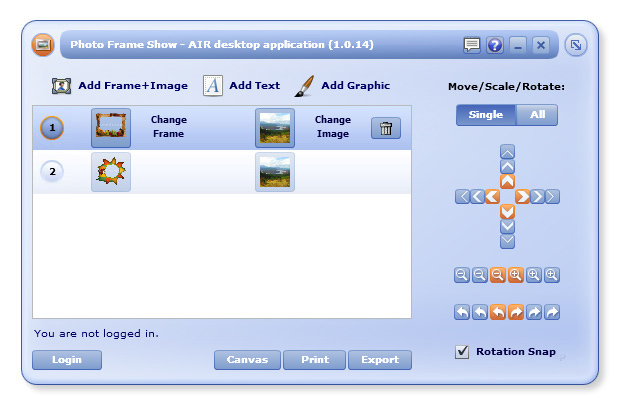 Finally, you can just click on the "Change Frame" or "Change Image" buttons to browse your Frames Gallery to select a new frame or browse your machine to select a new photo/image. How do I change the order of my framed images? In the Layers list you can change the order of appearance if you right-click on one of the numbers at the left of each layer then choose the desired position. 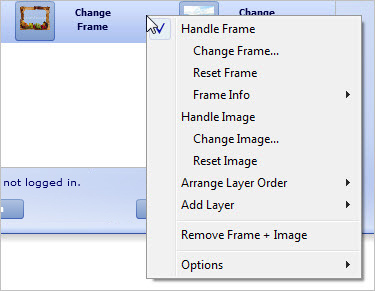 You can also do this if you right-click on the framed image (in the Canvas) and use its context menu. Can I "Save" my work and re-open it in another session? There is no such functionality. To "Save" a project keep in mind that when you start a new frame+photo composition you should "Export" your work as a JPG/BMP/PNG image or "Print" it. 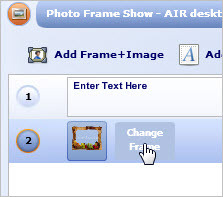 How do I send my framed image via e-mail? PNG (with transparecy enabled) is ideal since your work will be saved as an image without any background color embedded and you can use it in any external application. Make sure that you also have checked the "Crop to Fit" option so that the exported image contains only the artwork and not the whole Canvas. The exported image can then be easily inserted into a message created via your E-mail client (like Outlook). What it the purpose of Canvas? The Canvas is a visual aid to demonstrate how the framed image will look when printed in an empty page. It is also a way to check how a framed image will look over a specific coloured background. This is very helpful if you plan to export your work and use it in a website or any kind of illustration where existing color choices could affect the visual impact your framed image will have. What happened to the old "Leave to Desktop" and "Get from Desktop" features? For technical reasons, these features are not available in this version of the application. How do I "Save" (or Export) my framed image? 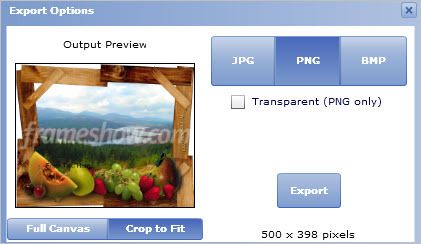 You can export your framed image as a JPG, BMP or PNG image. How do I download more frames or graphics? Note: For Frequently Asked Questions (FAQ) on your Photo Frame Show account click here.